The Guadeloupe Islands deliver a full complement of vacation delights. You can find relaxation at indulgent beachfront resorts, pampering spas and upscale dining venues, or spend your days in active pursuits such as diving, island hopping and hiking the rainforests. And should you feel the urge to try something beyond the ordinary, there are plenty of options in this department as well. Here are seven unexpected adventures that anyone can enjoy. 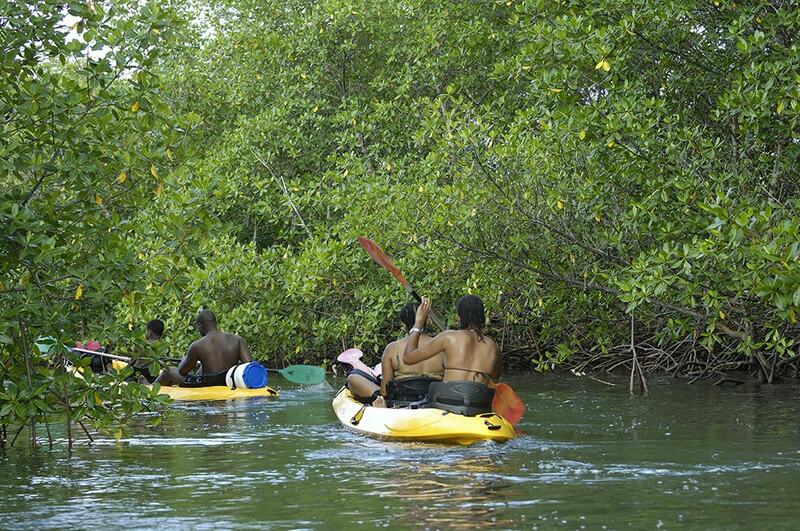 The mangrove channels of the Grand Cul-de-Sac Marine provide kayakers with a watery maze filled with marine and bird life. Guadeloupe’s Basse-Terre island is a land of rainforest-clad slopes, waterfalls, bubbling hot springs and remote forest glens that are home to more than 270 species of birds. Rising nearly 5,000 feet above it all is the imposing silhouette of La Soufrière Volcano. This semi-active volcano last erupted in 1976 and has been simmering away quietly ever since. Reaching the summit is no stroll in the park, but it’s also not as difficult as one might imagine. A road leads up the slope to a parking area at an elevation of 3,100 feet. From there, it takes most hikers a bit less than two hours to climb the remaining 1,700 feet to the top. Along the way, rainforest slopes turn to stunted groves, then lava fields where underground vents known as fumaroles release Sulphur-laded steam. The most fascinating sight is a look into the alien-like landscape of the inner crater, where a wide crevice known as Hells Gate releases clouds of smoke and steam. 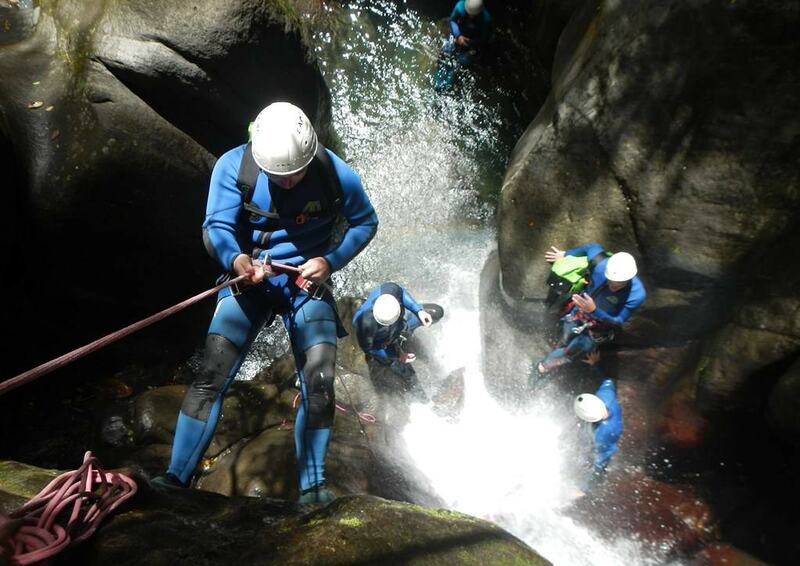 Canyoneering is a sport in which participants climb, rappel and swim through rushing rivers and waterfalls. The blue waters surrounding Guadeloupe are home to more than 20 resident and migratory species of whales and dolphin, and you don’t have to go far from shore to find them. A signature sighting is the sperm whales that pass close to the western shores of Basse-Terre each winter, earning the island the distinction of being one of the best places in the world to see and possibly swim with these impressive animals. Other regulars include humpbacks, pilot whales and spotted dolphins. At any time of the year, operators claim a better than 60 percent chance of finding the sperms, and encounters with one or more of the area’s other types of whales or dolphins is all but guaranteed. A favorite is the large pods of spinner dolphins, which can number in the hundreds, and provide an aerial show as they leap and twist. 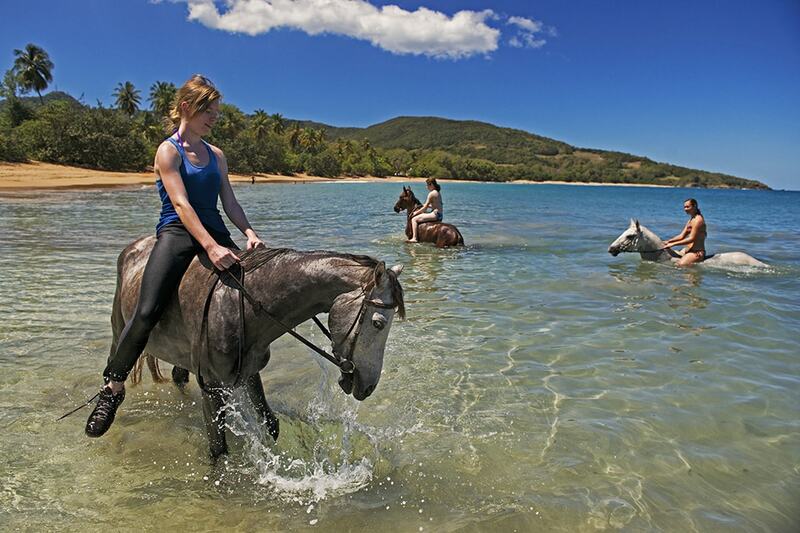 A trail ride in Guadeloupe might end with a horse-and-rider swim in the ocean. If you think of raccoons as garbage can tipping nuisances, you haven't met the raccoons of Guadeloupe. These animals are smaller and more delicate than their common North American counterpart, and they sport shiny grey coasts. The locals love their raccoons, which enjoy protected status and have restaurants and shops named after them. The Guadeloupe National Park as adopted a character known as Ti’ Raccoon as their official mascot, and you'll see images of this cute furry mascot on signs and the park logo. Some islanders keep raccoons as pets, but the national park on the island of Basse-Terre is the best place to see these animals in the wild. Take a hike into the rainforests and there's a good chance of finding a raccoon. One of the best places to look for them is along jungle streams, where they gather to hunt for crayfish. 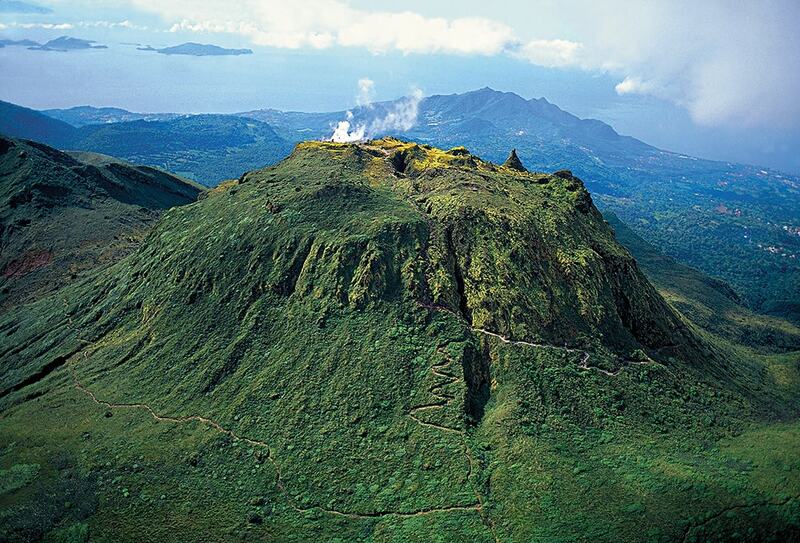 La Soufrière Volcano rises nearly a mile above the island of Basse-Terre. The climb to the summit is challenging but rewarding. There are a number of horse stables scattered across the islands of Guadeloupe. Some provide trail rides along forest paths and coastal trails, others bring you to the beach for a canter in the surf. As part of these coastal tours, participants may be encouraged to shed the saddle and take their horse for a swim in the ocean. Horse-and-rider swims also take place in clear-water rivers in the forests of Basse-Terre. 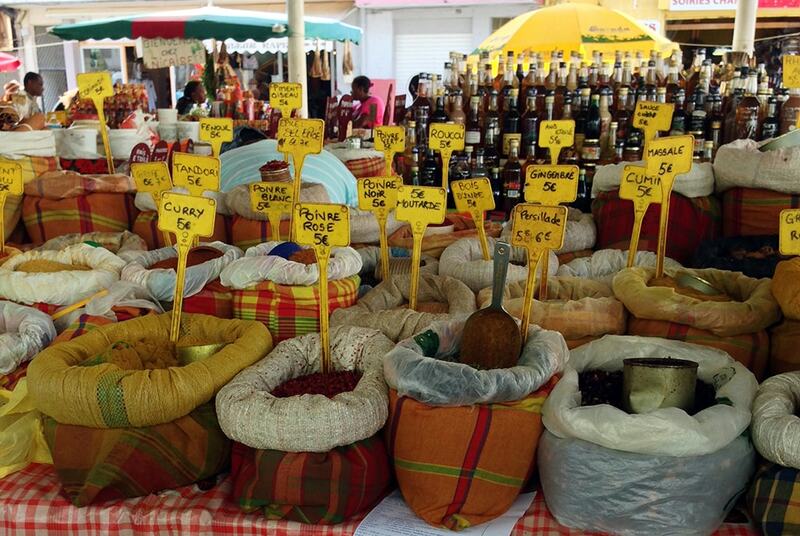 The Saint-Antoine spice market immerses visitors in the aromas and flavors of Guadeloupe's Creole heritage. A European tradition goes tropical in the jungles of Guadeloupe. Adventure parks trace their roots back to French rope training courses from the 19th century, and offer not only zip lines, but also high-flying networks of rope bridges, climbing nets and aerial obstacle courses. On Guadeloupe, a pair of courses now stretches through the forest canopy, reaching heights of 60 feet to challenge both nerve and skill. Harness and safety lines remove the risk while retaining the thrill, and there are courses designed to suit all ages and abilities. As an added attraction, parks include ground-based adventures such as orienteering courses, off-roading trails and treks to Jungle Rivers and waterfalls. For the ultimate in rope work and adventure, you can even sign up for a canyoneering trip that will have you rock climbing, rappelling and jumping off cliffs into freshwater pools as you make your way down a jungle stream that rushes through a narrow canyon. 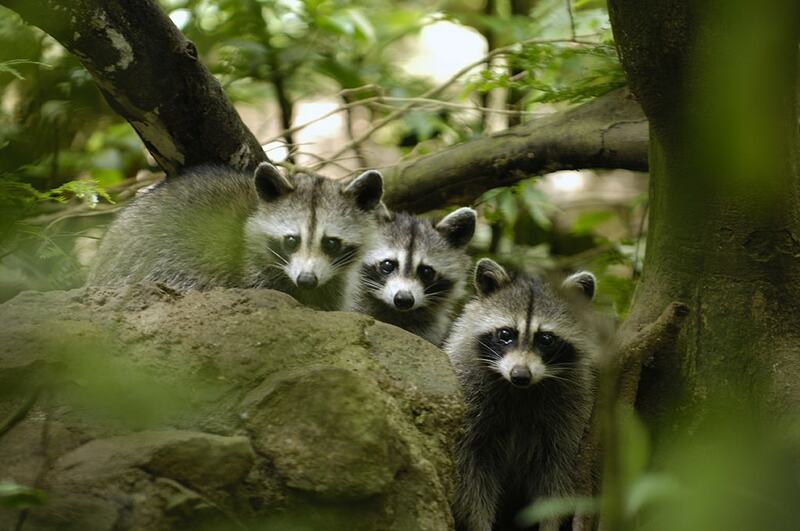 The raccoons of Guadeloupe have become the icon of the country's national park. Guadeloupe has a lot to offer paddlers, from easy excursions along the coast and trips to deserted beaches to explorations of the Pigeon Islands. And for a look at the wilder side of these islands, there's the Salée River and the Grand Cul-de-Sac Marine. This river creates a narrow channel between the islands of Basse-Terre and Grande-Terre. Kayakers can follow this waterway to enter the Grand Cul-de-Sac Marin, which encompasses some 16,000 acres of mangrove lagoons and channels. This n watery maze is a haven for marine and bird life, and a pleasure for paddlers seeking to leave behind any hint of civilization. 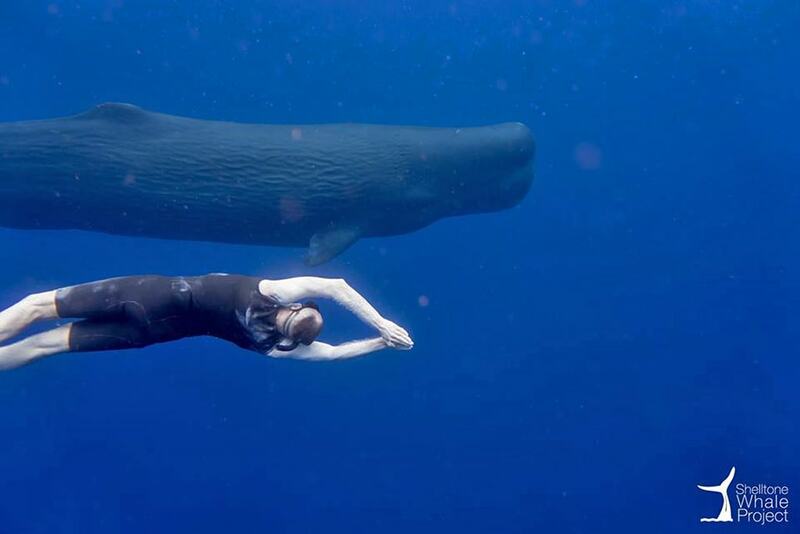 In addition to whale and dolphin watching tours, Guadeloupe offers select opportunities to swim with the whales. Ready to plan some unique Guadeloupe adventures of your own? You can start by giving one of our expert agents a call at 800-330-6611 or just send a note to sales@caradonna.com.